Location, parking is great! 2 minutes waling to Darling harbor. Fetching the keys was easy. The apartment was nice and clean, kitchen was OK. Beds were comfy, bathrooms enormous. Very close to darling harbour and excellent for large family of 7. Nice views and large balcony. Great quality of accommodation with plenty of room and great views. Had 5 in apartment, with comfy beds for all and double bathroom. It was close to Darling Harbour.... about a 5 minute walk. The apartment “penthouse” was old but renovated nicely. It was quiet. The staff were very helpful and friendly. Do go expecting something high end. I would stay in the same apartment again. The beds and pillows were amazing. Having a fan in the bedroom was fab! Brilliant location just 5 min from darling harbour and pyrmont ferry. Very clean, check in easy. We were leaving late at night and kept our bags so we could continue to sightsee. The location is a minute walk away from Darling Harbour. Easy to reach LRT station and the shopping center. Allowed to drop off luggages before check- in time. The bed and linens were amazing, I don't think I've slept in many beds that comfy. View, cleanliness, spacious living room and kitchen/dining area, close to shop, close to taxi. Lock in a great price for Liv Arena Apartments Darling Harbour – rated 8.6 by recent guests! 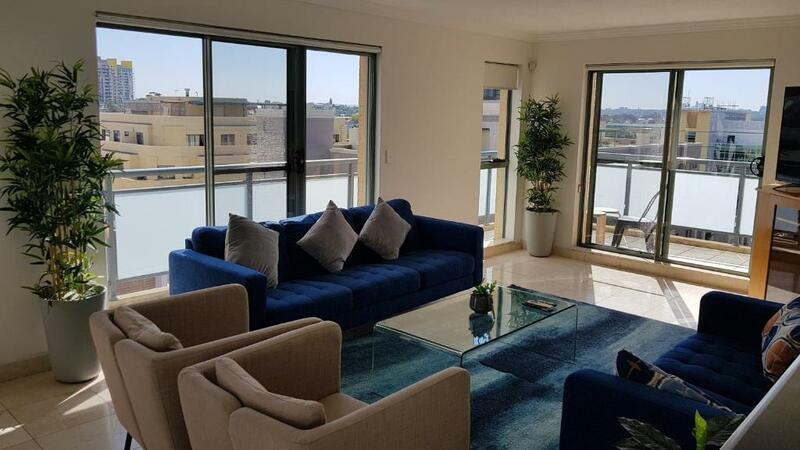 Liv Arena Apartments Darling Harbour This rating is a reflection of how the property compares to the industry standard when it comes to price, facilities and services available. It's based on a self-evaluation by the property. Use this rating to help choose your stay! One of our top picks in Sydney.Just a 5-minute walk from Darling Harbor, this property offers accommodations in the heart of Sydney's dining, shopping and entertaining precinct. Enjoy views from the balcony of each apartment. Free WiFi and free parking is provided. Liv Apartments Darling Harbor is a 7 minutes' walk away from the bars and restaurants of King Street Wharf. Explore the wonders of the harbor from the safety of the SEA LIFE Sydney Aquarium, 1.4 mi from the property. Each self contained apartment includes air conditioning to ensure you are comfortable in any season. Cook up a storm in the fully equipped kitchen. After a day of exploring, relax in front of the flat-screen TV with satellite channels. The bathroom offers a shower over bath and complimentary toiletries. Kingsford Smith Airport is 4.3 mi from Liv Apartments Darling Harbor. When would you like to stay at Liv Arena Apartments Darling Harbour? This apartment has a tile/marble floor, air conditioning and stovetop. Please note any alternative bedding configurations will cost AU$55 for the entire stay. This will need to be requested in the Special Requests box at the time of booking. All guests must sign the property's Terms of Stay prior to arrival. The property will be in contact with guests after booking. This apartment features a sofa, balcony and air conditioning. This apartment has a kitchen, air conditioning and seating area. This apartment features a seating area, toaster and view. We are located in Darling Harbour which is a large tourist attraction, the area is very safe. Nearby you can visit Sydney Aquarium, Madame Tausaud's Wax Museum, Harbourside Shopping Centre and the Darling Harbour kids park. House Rules Liv Arena Apartments Darling Harbour takes special requests – add in the next step! Liv Arena Apartments Darling Harbour accepts these cards and reserves the right to temporarily hold an amount prior to arrival. Please note that there is a 2.9% charge when you pay with an American Express credit card. Please note that there is a 1.6% charge when you pay with a Visa, Mastercard or an EFTPOS debit card. You must show a valid credit card and photo ID upon check in. This credit card and photo ID must be in the same name as the guest's name on the booking confirmation. The bed was too soft for me, way too soft. Was expecting the penthouse apartment shown in the picture as the penthouse apartment certainly not it!! Location of the garbage bin in the kitchen - obstacle course with the fridge. Beds were comfortable and the showers had great pressure. The location was nice and close to everything at Darling Harbour. Lovely apartment with everything we needed. Short walk to Darling harbour. Very well located property, short walk to Darling Harbour and restaurants. Also located close to ferry services and light rail service. Well appointed apartment with all facilities, clean and well appointed. Extremely good value for money. Perfect location, quick and easy check in and check out. The bathroom toiletries smell great. The beds were super comfortable and everything was clean.